These women of Kentucky broke many barriers to become pioneers in aviation history. Willa Brown Chappell (1906-1992), a native of Glasgow in Barren County, was the first African-American woman to be licensed as a private pilot in the United States. This was in 1937; in 1943, she was the first women to hold both an aviation mechanic’s and commercial pilot license. She went on to co-found the National Airmen’s Association of America. This organization promoted interest in aviation and supported pilot training positions for black aviation cadets. As a director of a racially segregated flight school in Chicago, Chappell participated in the training of more than 200 student pilots that later became members of the Tuskegee Airmen. Chappell was recognized in 2002 as one of Women in Aviation’s 100 Most Influential Women in Aviation and Aerospace. See also her picture and bio at Black Wings; see also the WCLU-FM website where you can find an audio-clip of a speech about Chappell from the Kentucky Women Remembered ceremony on March 15, 2012, in Frankfort. Esther Mueller Ammerman and Mary Edith Engle are considered pioneers due to their service in the Women Airforce Service Pilots (WASP’s) during WWII. Created to ease the demand for pilots, the WASP’s were organized in 1943 to fly noncombat missions in support of the war. Applicants numbered 25,000 and less than 2,000 were accepted into the program. Two who were accepted were Ammerman and Engle. Ammerman, originally from Thayer, Nebraska, is a resident of Cynthiana in Harrison County. Engle is a native of Lexington who continued flying after the war as a member of the International Organization of Women Pilots (the Ninety-Nines). Each gained pilot flying hours in the multiengine bombers of the day, including the B-29 strategic bomber, the type of plane flown in the atomic bombing missions that ended the conflict in 1945. Even though they flew a variety of non-combat military missions, the WASP’s had no military status when the unit was disbanded in 1944. This was changed by an act of Congress in 1977, when military protocol and benefits were granted. In July 2009, the Congressional Gold Medal was awarded to the WASP’s for their service to the United States. A fourth pioneer in the Aviation Hall of Fame made her accomplishments in design and engineering. Dr. Shelba J. Proffitt, a native of Whitesburg in Letcher County, was a member of the Wernher Von Braun missile development team at NASA. She later held key positions at the Marshall Space Flight Center in Huntsville, Alabama. From NASA she moved to development work on advance tactical missile systems. At the US Army Space and Missile Defense Command, she was the first woman to join the Senior Executive Service. As Director of the Advanced Technology Directorate, and Director, Sensors Directorate, Dr. Proffitt addressed the numerous technical issues of missile defense systems. 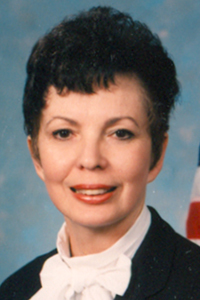 In 2001, she had total responsibility for developing air and missile systems as Acting Program Executive Officer. Dr. Proffitt’s capabilities were recognized by the Women in Science and Engineering Lifetime Achievement Award in 1996 and the Von Braun Engineer of the Year Award in 1999.